In this lively and exceptionally enjoyable book, Niki Segnit takes 160 popular ingredients and explores all the ways they might be combined in the kitchen. She has scoured thousands of recipes in countless recipe books, talked to dozens of food technologists and chefs, and visited hundreds of restaurants - all in her quest for flavour pairings. The result is a unique book that is full of quirky observations, practical information (hundreds of recipes are embedded in the narrative) and good jokes. Celery and Dill: Like a couple of spry septuagenarians who still bother to find the right necklace for their frock, wear silver shoes to the theatre and are more than capable of a waspish, flirty conversation if given the attention they deserve. Come alive in the red-blooded company of beef, or more workaday tinned tuna, but left to their own devices can make a thrifty but classy soup. Coriander Leaf and Peanut: Substitute coriander and peanut for basil and pine nuts and you have a delicious Vietnamese-style take on pesto. Process a large bunch of coriander leaf with a tbsp ground nut oil, a tsp fish sauce, maybe a few mint leaves if you have them, some chilli and a squeeze of lime. Add half a handful of ground peanuts. Toss through warm noodles - egg or rice - and serve with more peanuts scattered on top. 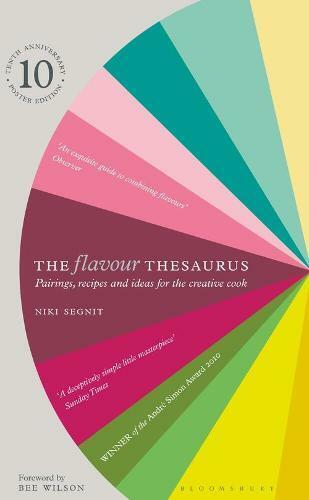 Beautifully packaged, TThe Flavour Thesaurus is not only a highly useful, and covetable, reference book that will immeasurably improve your cooking - it’s the sort of book that might keep you up at night reading.